Styled with tia blouse . 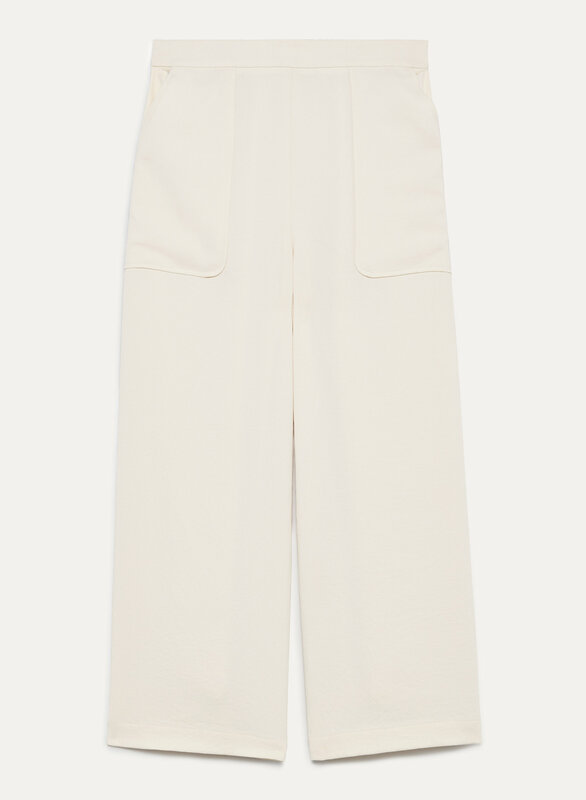 Made from a luxe Japanese fabric with an intricate basketweave texture, these cropped pants have a pull-on elastic waistband. So they look polished but are secretly really, really comfortable. Comfy and fits perfect. I stoked that I got to grab these on sale! I was vacillating whether I should get these pants due to my height 5ft and petite frame for fear it would make me look boxy and big. However, the material falls very nicely and it is not overwhelming. The pants fall to my ankle which is fine. I like the pockets which are practical but they don't really dominate the look. They are very comfortable and versatile. It looks better with a blouse that has a little peplum-like bottom to cover the elastic waistband at the back; (just like what the model is wearing). I have this pant in black (which I've had for about a year) and just bought the green shade on sale since I've loved my black ones so much. I can't tell you how many compliments I've had on both colours. These feel so good on with the stretchy waist and the flowy pant legs. The craftmanship and fabric are top quality, as expected. I love this wide leg trend so much. Great for wearing to work or going out for a fancy dinner. Also love the pockets stitched on the outside for a unique detail. I highly recommend these pants! For reference, I wear a size 28 in skinny jeans and the size Small in these fits perfectly. good quality. very nice pant. This is absolutely the pants I want. Very elegant and comfortable. I like the color: ivory. It makes this pants so gentle and soft.